Planning Commissioners devoted the bulk of the Nov. 14 meeting to deliberate over the proposed Gateway Crossings project at 1205 Coleman Ave. After much discussion about affordable housing and traffic impacts, the members voted to approve the Environmental Impact Report, a General Plan amendment to allow for high density housing associated with the project as well as a new zoning category, Very High Density Mixed-Use, which the project will fall under. The proposal will go before the City Council on Dec. 4. “Gateway Crossings is the missing residential component to a much larger transit village that’s bookended by Coleman Landings to the South and Costco Center to the North,” said Josh Rupert, director of development for Hunter Storm, the project’s developer. 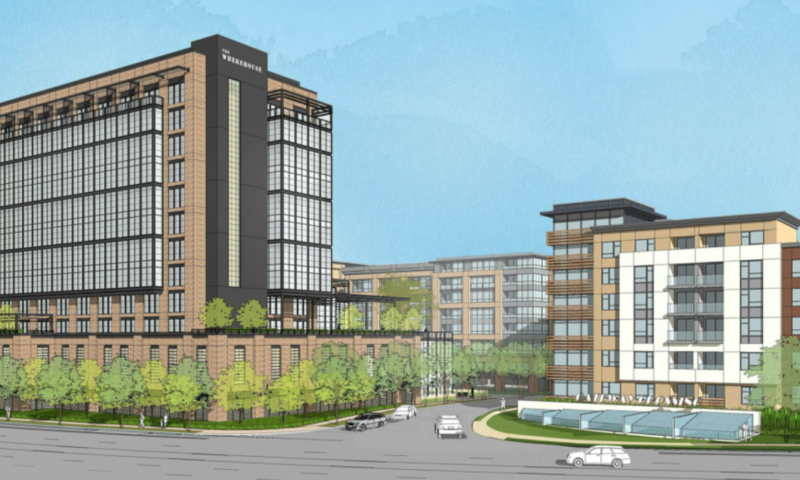 If approved the project will add 1,600 housing units, 15,000 square feet of retail, a 225 room hotel with dining, amenities and conference rooms, a 2.1-acre park, 2,783 parking spaces and a street network including a new public street. It’s located within the Santa Clara Station Focus Area. Because the development application was submitted prior to the affordable housing ordinance taking effect, it’s not required to set aside 15 percent of the units as affordable. The developer was originally going to offer 10 percent affordable housing, half of which would be onsite, while the other 50 percent would be paid in affordable housing fees versus the creation of new units. Commissioners Steve Kelly and Raj Chahal weren’t satisfied with in lieu fees, and got the developer to agree to create the full 10 percent in onsite units, affordable to those with moderate incomes. Several members of the public attended the meeting and pointed out that three prior outreach meetings for the project were sparsely attended and complained about the lack of notification. They voiced concern that the density of the project was not high enough for the formerly industrial area that’s geared to become a transit hub. An appeal was brought to the Commission of the Zoning Administrator’s denial of minor modifications for a single family home at 1940 Avenida De Las Rosas. The home in the vicinity of single family homes and an apartment complex to the rear, is owned by a family who sought a new front porch with roof cover, interior renovation and a 522 square foot addition to the rear of the house. As part of the changes they requested a variance to allow for at 15 foot rear yard setback from the adjoining property instead of the standard 20-foot setback, which the zoning administrator denied. Despite Planning staff’s recommendation to overrule the appeal and uphold the zoning administrator’s denial, Commissioners voted in favor of the appeal, denying the zoning administrator’s decision. Citing, “practical difficulties of the location” they voted to allow the modifications in part because the reduced setback won’t cause privacy issues since the property to the rear is an apartment complex. The homeowners had also gotten signatures of support from neighbors. A study session was conducted by Assistant City Attorney Alexander Abbe about the Brown Act named after Ralph M. Brown. The Brown Act provides meaningful access for the public to local legislative decisions, including boards, commissions and task forces. The Planning Commission is subject to the Brown Act for anything related to service for the City, though “ad hoc” committees are exempt. The legislation mandates that the public be able to witness and participate meaningfully in government discussions and actions. Shawn Williams recently joined the Planning Commission as a new member. As Commissioner Raj Chahal was recently elected to City Council, a new seat on the Commission will open up in December. $154,000 is the Answer, But What’s the Question?